Background: Primary dental care can be a way of achieving good oral health for the community. This can be achieved by integration of oral health care with the existing primary health care activities through training of primary health care workers on aspects of oral health. Objective: To assess the effectiveness of oral health education among primary health care workers at the primary health center (PHC) in Nellore district, Andhra Pradesh. Materials and Methods: Descriptive longitudinal study was conducted from June 2010 to August 2010 at a PHC. Knowledge about oral health among primary health care workers was pretested using a self-administered questionnaire prepared in local language (Telugu). Later after a month health education was provided to the health workers, and pamphlets with information on oral health were distributed. Posttest assessment was done 1-month after providing health education using the same questionnaire. Statistical analysis was performed using the SPSS 12.0 software, Student's t-test was used to compare knowledge scores between pre and posttests. Results: A total of 118 Primary Health Care Workers with the majority in the 20-30 years age group participated in the study. Posttest assessment showed a change in knowledge level with an overall increase in knowledge level of primary health care workers with a mean difference of 12.56 ± 3.23, which was highly significant (P < 0.001). Conclusion: The knowledge about oral health was poor, and it improved after providing health education to primary health care workers. Change in knowledge was appreciable and may play a key role in oral health promotion of the vast majority of the rural population. India is a vast country with the majority of people living in rural areas. Following the Alma Ata declaration of 1978 on the appropriateness of "primary health care," rural health infrastructure has been designed to cover rural population through subcenters, primary health centers (PHC) and community health centers. As oral health is an integral component of general health, Oral health care of the necessity has to be delivered through primary health care infrastructure. Primary health care workers might play a key role in these areas where there is a deficiency of dental surgeons in providing oral health care services. Multipurpose health workers (MPHW) play a vital role in the rural health care delivery system. MPHW female (MPHW [F]) should be sensitive and accountable to meet the health needs of the community. The Anganwadi worker (AWW) is a community-based voluntary frontline workers of the integrated child development scheme (ICDS) program. Selected from the community, she assumes the pivotal role due to her close and continuous contact with the beneficiaries. Accredited social health activist (ASHA) is a health activist in the community who will create awareness on health. Primary dental care can be a way of achieving good oral health for the community by the integration of oral health care in the existing primary health care activities. This is possible through training of primary health care workers about oral health. Primary health care workers get rigorous training in various health aspects, but oral health is given a low priority in their training curriculum. There are only few studies , conducted on primary health care workers to assess their knowledge, attitude and practices toward oral health, However, only few studies , were conducted to assess the effectiveness of oral health education among primary health care workers. In India, only one study  has been conducted in Kerala. Hence, this study was planned with an aim to assess the effectiveness of oral health education among Primary health care workers at a PHC in Nellore district, Andhra Pradesh. The objectives of this study were to assess the knowledge of primary health care workers regarding oral health, to provide health education to primary health care workers regarding various aspects of oral health and to study the change in knowledge level after providing oral health education. A descriptive longitudinal study was conducted at a PHC in Muthukur Mandal of Nellore district of Andhra Pradesh over a period of 3 months from June 2010 to August 2010. This PHC is one major peripheral center for rural out postings adopted by Narayana Medical Institution. Ethical approval for conducting the study was obtained from Institutional Ethical Committee. Permission was obtained from the medical officer of PHC and ICDS project officer to conduct the study after explaining the study procedure. All the health personnel working in the PHC's and peripheral health centers were invited to participate in the study. Those health personnel who were willing to participate and who gave informed consent were included in the study. A self-administered close-ended questionnaire was prepared using the training manual for health workers, National Oral Health Care Program (NOHCP)  in English. The questionnaire was given to two experts in the field of dental research, and their response was recorded. The content validity was assessed using Davis criteria  (1 - not relevant, 2 - somewhat relevant, 3 - quite relevant, and 4 - highly relevant). Content validity index  was 1.0 and 0.9 for two experts respectively and scale content validity index  was 0.9 for both experts. Then the questionnaire was translated into local language (Telugu) and it was checked for cross cultural sensitivity with the help of a bilingual expert. The translated question was checked for reliability by test-retest method among ten participants who completed the questionnaire twice with 2 weeks apart. The questionnaire consisted of demographic data and questions built on 5 domains about oral health-normal oral anatomy, dental diseases, oral cancer and precancerous lesions, infant dental care and geriatric dental care. 3. Posttest: After 1-month the investigator visited the PHC and performed post-test assessment using the same questionnaire on the participants. Analysis was performed using the SPSS 12.0 software (SPSS Inc., Chicago, IL USA). The results of basic demographic data and effectiveness of education in Primary health care workers were expressed in percentages. A paired t-test was used to compare knowledge scores between pre and posttests. Correlation of knowledge score was done with demographic data at pre and posttests. Statistical significance level was kept at 0.05 (P value). Among 118 health workers who participated in the study, majority (94.1%) were females and most of the participants belong to 20-30 years age group. About 79.7% of participants had completed their secondary school, and only 4.2% of them were graduates. 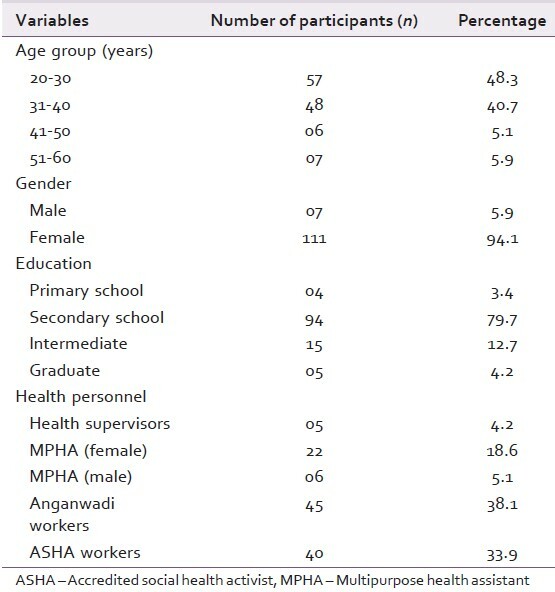 Majority of the primary health care workers who participated in this study were AWW's (38.1%) followed by ASHA workers (33.9%,) [Table 1]. In order to assess the effectiveness of oral health education, the percentage of correct responses were calculated for all 5 domains at pre and posttests in which increase in knowledge among health care workers was observed [Table 2]. Posttest analyses showed an overall increase in knowledge level of Primary Health Care Workers with a mean difference of 12.56 ± 3.23 which was highly significant (P < 0.001) [Table 3]. Correlation of knowledge score with age at pre and posttests showed that knowledge score was low at pretest with a significant difference (P < 0.05) among different age groups. At posttest, knowledge score increased among all the age groups with no significant difference (P = 0.28) among different age groups [Table 4]. Correlation of knowledge score with gender showed a significant difference (P < 0.05) between males and females with males having higher knowledge score at pretest. 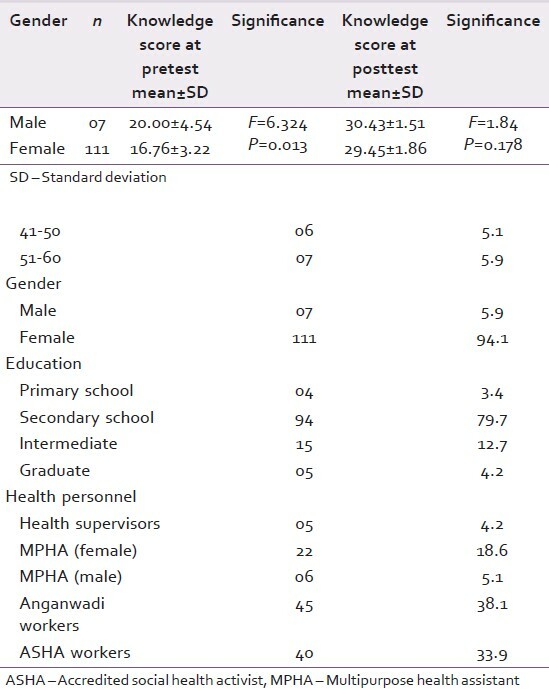 However after education though the knowledge was increased, there was no significant difference (P = 0.17) between gender [Table 5]. 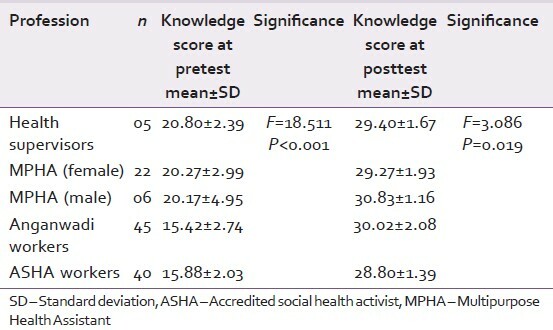 Analysis of data showed that knowledge score was differing significantly among health personnel's at pretest (P < 0.001), with health supervisors having highest score. However, analysis after education revealed that there was an increase in knowledge about oral health. The difference in knowledge score was statistically significant (P < 0.05) with AWWs having best knowledge posttest [Table 6]. On correlating the knowledge scores of Primary Health Care Workers with education, there was no significant difference (P = 0.225) in knowledge level at pretest. However, results were statistically significant (P < 0.05), showing increase in knowledge for graduates at posttest [Table 7]. The knowledge of the participant was assessed using a questions built on 5 domains about oral health - the normal oral anatomy, dental diseases, oral cancer and precancerous lesions, infant dental care and geriatric dental care. Questionnaire was prepared using the training manual for health workers, NOHCP  in English. Since this training manual - NOHCP is used in India for training of health workers for NOHCP, it was used as a standard reference for preparing the questionnaire for health workers. At base line pretest assessment of the knowledge of the health workers was done using a questionnaire and this was, followed by posttest assessment after giving educational intervention. The Oral health education rendered in the present study was well-received by the Primary Health Care Workers similar to other studies. ,, Prior to oral health education, the participants had enough knowledge about normal oral anatomy. However after education, their knowledge improved further which was similar to a study by Ocek et al. Though the study showed that the primary health care workers have knowledge about oral health, few knowledge gaps could be identified at pretest assessment. The misconceptions regarding the causes of oral diseases were commonly found worldwide regardless of geographical location and professional status  were observed even in these primary health care workers, and these gaps in knowledge that were identified at pretest assessment were filled to a satisfactory extent through the educational intervention which was provided to these primary health care workers. The participants had less knowledge about infant dental care at pretest, which improved after rendering health education. It is very important to take care of milk teeth as decay-free milk teeth create a healthy environment for the permanent teeth. Only a few participants had knowledge about dental caries and periodontitis, which later improved these findings were similar to the findings of the study conducted by Nair et al. As the treatment of dental diseases is costlier, it is better to prevent dental diseases by educating and creating awareness among health workers, which might help them educate the public. Majority of health workers felt that loss of tooth is age-related similar to the findings of the study by Sequeria et al. The proportion of participants with knowledge about geriatric dental care was low prior to health education, which improved later on. In our country, the population who have attained 60 years of age, is expected to shoot up by 360% by 2050. According to a report by United Nations Population Fund "India has around 100 million elderly at present, and the number is expected to increase to 323 million, constituting 20% of the total population, by 2050." As 80% of people reside in rural region health services should be provided to them through primary health care workers. So by educating the health care workers about geriatric oral health might help them to provide more services to the older people. Only 17% had correct knowledge about oral cancer at pretest. The proportion increased to 54% after education. Studies , conducted previously on primary health care workers established the feasibility of using these health care workers for the early detection of oral cancer and precancerous lesions as well as their ability to diagnose these lesions accurately. Training the Primary health care workers in screening for oral cancer could have a significant effect on reducing mortality from cancer in the country like India. Educating the health workers about oral health showed a positive effect irrespective of their age which was low at pretest. The oral health addressed to primary health care workers was equally received by both genders after education. Prior to health education, the knowledge regarding oral health was low among females than males that improved substantially after the educational intervention. Among the health personnel, the most of the health supervisors had knowledge about oral health prior to education. However after education all the different cadre of workers showed improvement in knowledge with maximum by AWWs. On correlating the educational qualification of health personnel with knowledge score at pretest, there was no difference. However after health education, knowledge level of primary health care workers increased with higher educational qualification. The present study did not check how far the knowledge gained by primary health care workers translated into positive practice and its applicability in the field. The present study showed that the knowledge about oral health was poor in Primary health care workers, and it improved after providing health education. Change in knowledge in the present study was appreciable, and it may play a key role in oral health promotion of the vast majority of the rural population. These health workers can serve as a valuable tool for population-based health promotion approaches in achieving health for all. 1. Bullet in on Rural Health Statistics in India. New Delhi: Issued by Infrastructure Division, Dept. of Family Welfare, Ministry of Health and Family Welfare, Nirman Bhavan; 2003. 2. National Oral Health Policy: Prepared by Core Committee, Appointed by Ministry of Health and Family Welfare; 1995. 3. Fourth Conference of Central Council of Health and Family Welfare-Proceedings and Resolutions. New Delhi, October 11-13, 1995. New Delhi: BUREAU of Planning, Directorate General of Health Services, Ministry of Health and Family Welfare, Govt. of India; 1995. 4. Oral Health. ICMR Bulletin. New Delhi: ICMR; 1994. p. 24. 5. Nutbeam D. Health literacy as a public health goal: A challenge for contemporary health education and communication strategies into the 21 st century. Health Promot Int 2000;15:259-67. 6. Guidelines for Multipurpose Health Worker (Male). New Delhi: Ministry of Health and Family Welfare, Government of India, Nirman Bhawan; 2010. 7. Curriculum of Intermediate Vocational Course in Multipurpose Health Worker (Female). Nampally, Hyderabad, Andhra Pradesh: State Institute of Vocational Education Office of the Directorate of Intermediate Education; 2008. 8. Chattopadhyay D. Knowledge and skills of Anganwadi workers in Hooghly District. Indian J Community Med 2004;29:117-8. 9. Park K. A Text Book of Social and Preventive Medicine. 21 st ed. Jabalpur: Banarsidas Bhanot Publishers; 2011. 10. Lal S, Paul D, Pankaj, Vikas, Hashish BM. National Oral Health Care Programme (NOHCP) Implementation Strategies (Editorial). Indian J Community Med 2004;25:3-10. 11. Van Palenstein HW, Mikx F, Truin GJ, Hoang TH, Pham HL. Workforce requirements for a primary oral health care system. Int Dent J 2000;50:371-7. 12. Sequeria P, Anup P, Srinivas P. A KAP study on dental health in Anganwadi workers. Indian J Community Med 2000;15:129. 13. Pankaj, Ankola A, Nagesh L, Hegde P. Knowledge, attitude and practices towards oral health among Anganwadi workers of Belgaum City, Karnataka. J Indian Assoc Public Health Dent 2005;5:14-6. 14. Frazão P, Marques D. Effectiveness of a community health worker program on oral health promotion. Rev Saude Publica 2009;43:463-71. 15. Ocek ZA, Eden E, Soyer MT, Ciçeklioglu M. Evaluation of a dental health education program for midwives. J Public Health Dent 2003;63:255-7. 16. Nair MK, Renjit M, Siju KE, Leena ML, George B, Kumar GS. Effectiveness of a community oral health awareness program. Indian Pediatr 2009;46 Suppl: s86-90. 17. Prakash H, Shah N. Oral Health Training Manual for Health Workers. New Delhi: NOHCP, DGHS, MOH and FW, Govt. of India; 2001. 18. Davis LL. Instrument review: Getting the most from your panel of experts. Appl Nurs Res 1992;5:194-7. 19. Lynn MR. Determination and quantification of content validity. Nurs Res 1986;35:382-5. 20. Waltz CF, Bausell RB. Nursing Research: Design, Statistics, and Computer Analysis. Philadelphia: F.A. Davis; 1981. 21. Mwangosi IE, Nyandindi U. Oral health related knowledge, behaviours, attitude and self-assessed status of primary school teachers in Tanzania. Int Dent J 2002;52:130-6. 22. Elderly to constitute 20% of India's population: UN. New Delhi, Indian Express; 2012 Oct 01. Available from: http://www.archive.indianexpress.com/news/elderly-to-constitute-20--of-indias-population-un/1010339/2. [Last accessed on 2014 Mar 20]. 23. Shah N. Geriatric oral health issues in India. Int Dent J 2001;51:212-8. 24. Warnakulasuriya KA, Ekanayake AN, Sivayoham S, Stjernswärd J, Pindborg JJ, Sobin LH, et al. Utilization of primary health care workers for early detection of oral cancer and precancer cases in Sri Lanka. Bull World Health Organ 1984;62:243-50. 25. Mathew B, Sankaranarayanan R, Wesley R, Joseph A, Nair MK. Evaluation of utilisation of health workers for secondary prevention of oral cancer in Kerala, India. Eur J Cancer B Oral Oncol 1995;31B: 193-6.